Yesterday’s post is super important to me. 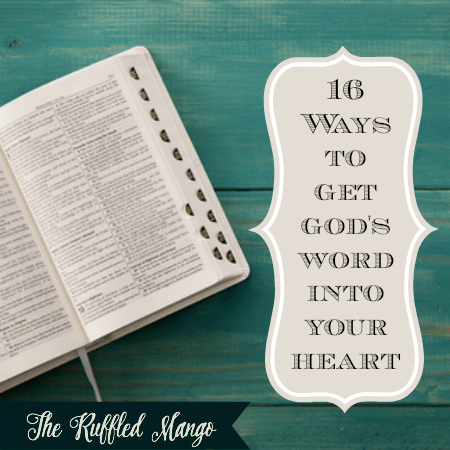 If you haven’t read it yet, go read that one first: Getting God’s Word into Your Heart. And then come back here to see a huge list of helpful, practical ideas to help you with this challenge! Promise me you’ll give these ideas a try. Not all at once. But do try more than one. And keep adding to your arsenal. If I’m going to remember something I hear or read, I almost always have to hear it/read it multiple times. And it helps to have it reinforced in multiple ways. So over the years, I’ve collected ideas here and there – and maybe expanded them into what works best for me. I hope that a number of these will work for you, too. Prayers for you on this journey, friends! It’s the most epic one of our lives! #1. Make time for God’s Word. As in, literally telling yourself something like, “If I don’t have time to read the Bible, I don’t have time to watch TV.” Or read a book for pleasure…or peruse Facebook…or shop online. Give God your firstfruits…your best. That also means, when you’re the least tired, if at all possible. He deserves it. But REALLY read it. Don’t just “call words.” Get out your pen or highlighters and truly focus on the most important words and thoughts. If you get distracted, back up and reread a bit before you go on. Say the words out loud. Practice saying them with expression and feeling. 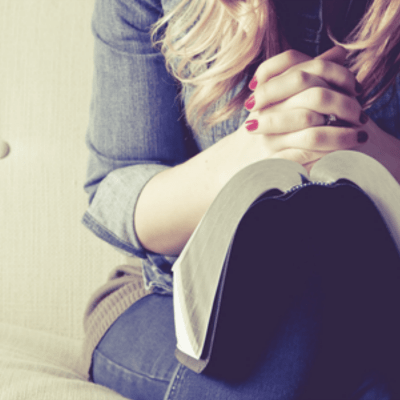 There’s almost nothing worse than a monotone reading of God’s Word! Hear your familiar voice reciting God’s promises, Jesus’ parables, the letters of Paul. There’s just something about seeing God’s Word in your own handwriting. It really helps cement it inside your brain. This month I’m enjoying following this scripture writing challenge. I’m definitely planning to keep this up, even though I missed a few days last week! It takes less than 10 minutes per day – and you guys, that is a teeny-tiny amount of time for a much bigger benefit! By the way, I like to read the words aloud as I write them. Then I go back and underline or star the most important words or thoughts. I finish up with a prayer to go along with that day’s scripture. That little quiet time is always uplifting. Highly recommended! #6. Listen to God’s Word. My husband listens to the Bible on his 30-minute commute every work day. He’s done that for over a year now. It has been fantastic for him – because he reads so much for work, he generally doesn’t enjoy reading much at home. (Unless he’s prepping for teaching our Sunday morning class) This way, he’s able to “read” through the entire Bible in much less than a year. Crazy! This year, I have started listening to it while I do the dishes (almost) every day. 😉 Our congregation has a reading plan this year that goes book by book in the New Testament (in chronological order); it’s been super easy to go to Biblegateway.com and find the next passage and press play. You can’t listen to every version, but there’s audio for the most popular versions of the Bible. This is a new one for me, but I alluded to it in #4 with the writing of God’s Word. Sometimes I haven’t known how to praise God very well, except for continually telling Him how beautiful the world is – “Thank you, God, for daffodils!” or “This sunset is amazing!” But when we read a scripture that tells us something about God, we can immediately use that very scripture to express our gratitude. #9. Read about God’s Word. If you’re not reading some thoughtfully written and scripturally sound books, articles, and blog posts (in addition to your regular scripture reading), you’re missing out, in my opinion. I cannot tell you how many times I’ve been enlightened about a particular verse that had previously puzzled me. However, don’t fall into the trap of ONLY reading what other people say about the scriptures. We humans are not infallible. We make mistakes. So always make sure what you’re reading matches up with what God really said. And that’s going to take some time being in the Word yourself. #12. Track your reading of God’s Word. Also, as I mentioned before, our congregation has a yearly Bible reading plan – the elders have bookmarks printed for each quarter. In the past, I’ve kept those in my Bible, but since I’ve been doing the audio version of the Bible this year, I simply stuck the bookmark front and center on the fridge. And I’m loving it! I see it multiple times a day and I can easily see how far my checkmarks go. Right now, I’m actually ahead (which has NEVER happened before with any Bible reading plan!) It’s definitely encouraging and makes me want to keep going! Get thee a commentary. For Matthew, Mark, Luke or John, may I recommend J.W. McGarvey’s The FourFold Gospel or A Harmony of the Four Gospels (The christian classic!) ? I’m only partway through, but it’s been fascinating. Our Sunday school class is going to use it for an upcoming study, too. Also, my parents gifted Jeremy with The ESV Study Bible . He absolutely is carried away with it. It’s fantastic for when he teaches Bible class. And I’m definitely going to start consulting it, too! Another funny thing will happen when you read your Bible more. You’ll want to talk about it more. So discuss it – with your spouse, your parents, your friends, your kids. You’ll be able to converse intelligently about it and understand the many layers of God’s plan of redemption. And that’s pretty cool. Do you have any more ideas to add to this list?? I’d love to hear from you!